This isn’t an add-on yet (although I may get round to making it into one), but it can be used by taking a copy of the script and running it in test add-on mode. I simply used stuff I already had, notably Configurable canvas meter and polling code from my other add-ons, so it was a trivial task to put it all together. Not much for now actually, It just polls a server function which returns the data on the latest sheet, but it measures how long each part of the journey took. 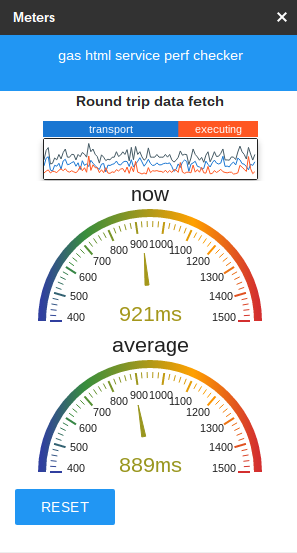 I’m reporting on roundtrip time broken down into transport time (how long it took to pass back and forwards the request), and execution time (how long the server part took to execute). I may add more stuff at some point. It looks like this and shows in real time over a repeated polling interval, how long it takes for html service running as an add-on takes to get a response to a request – in this initial proof of concept case, it simply reads and returns the active sheet data. ☑Get the script and make a copy.